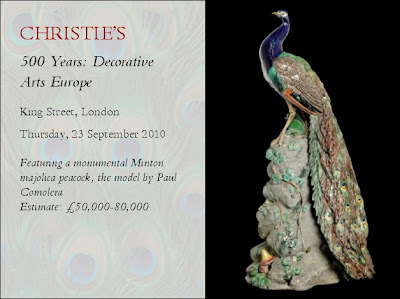 MEMBERSHIP ALERT: At our 2010 Convention Melissa Bennie of Christie's shared the fact that on September 23, 2010 a Minton Peacock would be at auction at CHRISTIE"S King Street London. Stay tuned for more news. 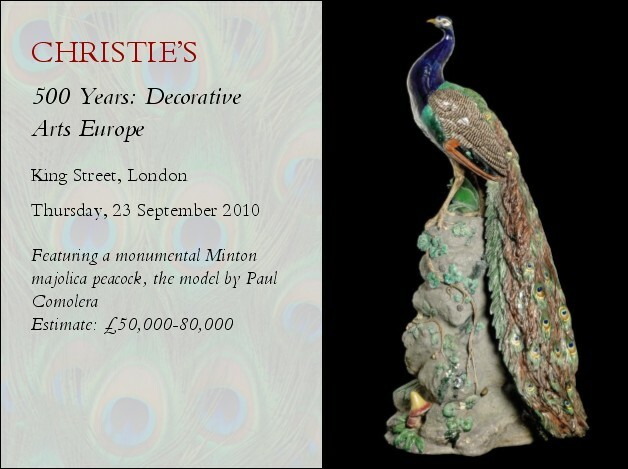 Sounds like a once in a lifetime opportunity to buy a minton peacock, or maybe not. This beautiful piece has just been added to the heritage register in Victoria, Australia. Recently valued at $4m, it will be interesting to see what the minton peacock is sold for in September. When in Australia - Flagstaff Hill is a must visit for Majolica Society Members.